Today, we are here with the first installment in our new series called FEATURE FILM FACE-OFF! In this segment, we will take two movies and pit them against each other in a cinematic battle for the ages! We will break down each film individually, compare and contrast them, and see which one will be crowned the winner. "Ocean's 8" will be released this June. In honor of that spin-off, our first match-up features Lewis Milestone's "Ocean's 11" (1960), starring The Rat Pack (Frank Sinatra, Dean Martin, Sammy Davis Jr.), versus Steven Soderbergh's "Ocean's Eleven" (2001), starring George Clooney, Matt Damon, Brad Pitt, and Julia Roberts. Is the original is always better than the remake? Let's examine each film and see if that's the case. +Stars The Rat Pack, who were very big at the time. -The main actors are essentially playing themselves. They all stand around acting cool with their same Rat Pack characteristics (e.g. Martin and Davis Jr. get to sing multiple times). +At least the actors look like they are having a good time filming the movie. -Characters lack depth beyond "old army buddies." -No real motivation for the crime apart from greed, with the exception of one character. -The movie is poorly paced and constantly drags, is a bit of a slog to get through. -Milestone spends too much time focusing on the least interesting parts of the story. -Too much time is spent on rounding up members of the crew. -There are several wasted scenes that never seem to serve any purpose. For example, there's a scene when one of the eleven meets his son and promises to take him to a ballgame that feels random and never comes back around. -Not enough time spent on the heist itself. -Their ultimate plan feels far too simple for a town as complex as Las Vegas (it was run by the mob, but they just leave safe doors open when there's a blackout?). -The story also wastes too much time on the post-heist attempt to get out of Vegas with the money. -There's a good number of plot holes in their "perfect" plan, many of which rely on pure luck and/or convenience. 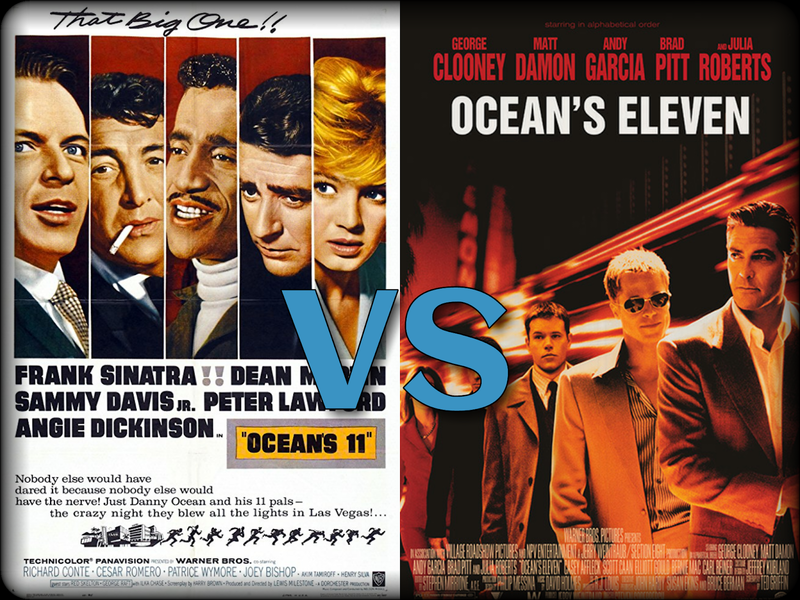 -We wonder why it's called "Ocean's 11" when the heist isn't actually Danny Ocean's idea. -The humor hasn't exactly aged well. +Has a great cast featuring some of the biggest names in Hollywood like George Clooney, Brad Pitt, Matt Damon, Julia Roberts, etc. -Most the actors play to type and do not go outside of their normal, charming personas beyond the fact that they are playing criminals. +We get a real feel for each character's personality, abilities, and what their contribution is to the overall plan. +Danny Ocean has a motivation beyond greed to pull off this particular job. +The pacing is good, and it moves breezily through its runtime. +The movie is put together well. Soderbergh presents information when it's necessary to make it more engaging and surprising for the audience. +The story itself is interesting and has added personal stakes for Danny Ocean. Even if it is as trivial as fighting over an ex, it makes the audience root for him more. +It doesn't spend too much time on scenes that feel unnecessary to the story. +The heist itself is very complex. We believe this would be necessary to rob casinos in a security-heavy town like Las Vegas. +The complexity makes the movie fun and adds tension because there so much could (and almost does) go wrong. +The cast looks like they had fun making this movie, and their fun makes the audience have fun, too. -There are a couple of contrived moments and even a few plot holes. +Unlike in the original, however, we have so much fun watching this version that we don't really notice these contrivances. -It has lost a bit of its edge over the years. We find ourselves examining it closer and picking it apart more as techs have advanced. With a more likable cast, properly fleshed out characters, a more engaging narrative, a much more fun atmosphere, and a faster-paced story that doesn't get bogged down in banal banter, we believe that Soderbergh's remake with George Clooney and company is far superior to Lewis Milestone's original Rat Pack showcase.